Cherie Friesen, left, accepts her $2,000 bursary from Diana Oliver, president of the High Prairie Health Care Auxiliary. 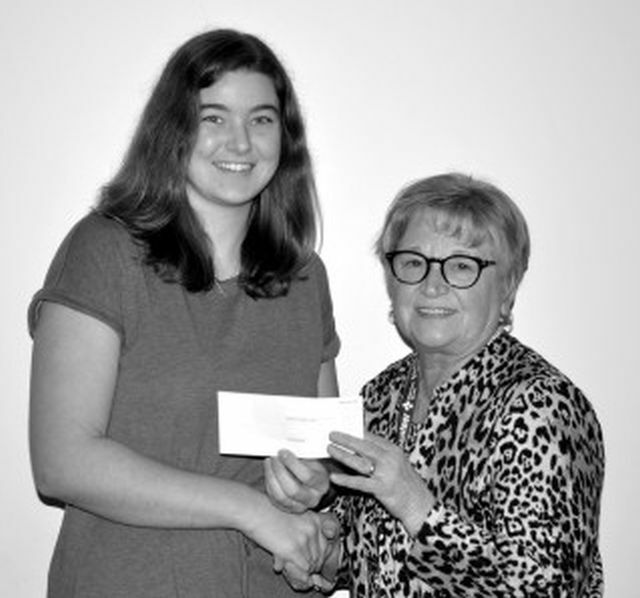 Three deserving young women are the recipients of this year’s health care bursaries from the High Prairie Health Care Auxiliary. Adria Cisaroski, Cherie Friesen and Andrea Werny received their $2,000 bursaries in early January. Auxiliary president Diana Oliver says some years the auxiliary has only given one or two bursaries, but this year the demand warranted three bursaries being awarded citing excellent applications. Oliver adds she is pleased local school districts are promoting the health care field as career choices. Cisaroski is in her fourth year at the University of Alberta, and her second year of the Bachelor of Science in Nutrition and Food Science in the Dietetics Specialization. “This program relates to the medical field by ensuring adequate health of the community and hospital patients through proper nutrition and nutrition education,” she writes in her application. She adds the bursary would be helpful in helping her pursue her dream of a career in nutrition and food science field. Cisaroski is the daughter of Trevor and Heather Cisaroski of High Prairie. Friesen is enrolled at MacEwan University in Edmonton, in the Bachelor of Science in the nursing program. She received First Class Standing in her second year of studies, she is currently in her third year. 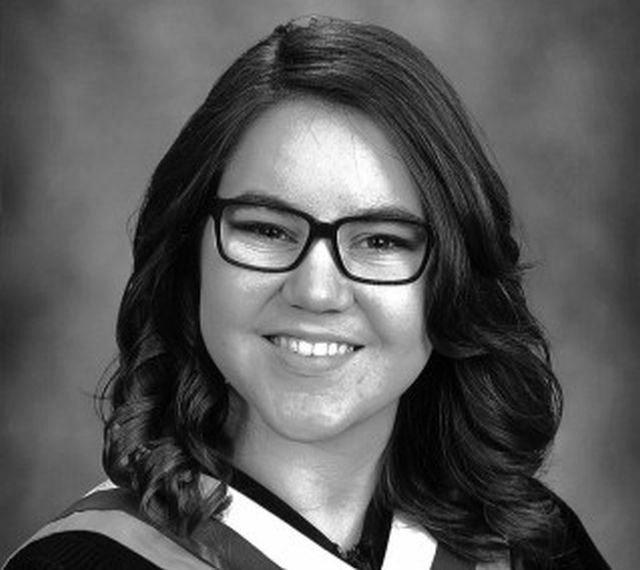 “I am planning to pursue a career as a Registered Nurse,” writes Friesen in her application. She has volunteered at the High Prairie Wilderness Camp since it was launched in 2016. She completed an Advanced Wilderness First Aid course in preparation for camp startup so she could be available as a camp medic. Friesen plans on returning to High Prairie after graduation. Friesen is the daughter of Russell and Gisele Friesen of High Prairie. Werny is a fourth-year biology student at Dalhousie University in Halifax. After graduation, she plans to work for the Canadian Transplant Society doing research on tissue and organ transplantation. “As part of my future work, I plan to be able to match patients and donors based on blood and tissue typing, as well as identifying biochemical markers in tissues so that the best possible match is made to minimize rates of graft versus host in donor tissue recipients,” she writes in her application. Werny was involved in the Alberta Innovates Heritage Youth Research Summer Program, which chooses students with strong academic backgrounds to work in a research lab. 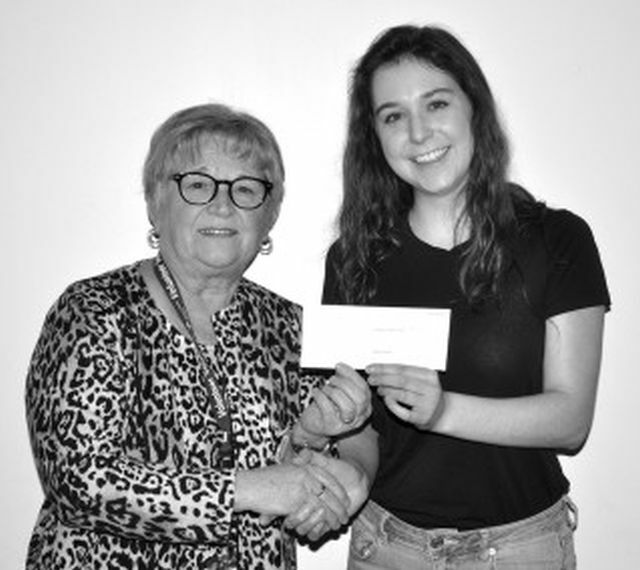 Adria Cisaroski, right, accepts her $2,000 bursary from Diana Oliver, president of the High Prairie Health Care Auxiliary. Andrea Werny is studying biology at Dalhousie University in Halifax, N.S. After graduation, she plans to work in the organ transplants field.